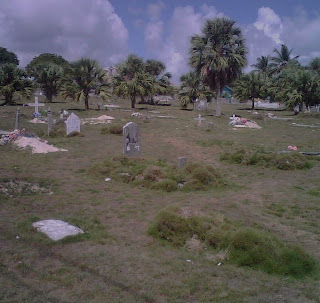 For the past five days, I've been in the Bahamas--trying to figure out what REALLY makes their sand pink, avoiding sharks and wandering through creepy Caribbean graveyards (see below). What's making some of the graves in the picture rise, I'd like to know? I have a feeling you'll be reading about this cemetery in one of my books someday. But while I'm all for sunbathing and relaxing, I think I'm ready for some serious adventure. So the next time I have a few days off, I'm heading down to Mexico's Yucatan Penninsula where archaeologists have discovered a real-life portal to Xibalba, the mythical Mayan underworld. 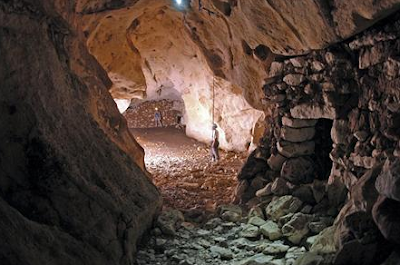 Deep underground lies a complex of caves that the Mayans believed was the route souls took to the underworld. At least eleven stone temples line the way--some underwater and others filled with human bones. According to one archaeologist, ancient Mayan texts said the dead followed a dog along a path, "filled with obstacles, including rivers filled with scorpions, blood and pus and houses shrouded in darkness or swarming with shrieking bats." Now THAT sounds like fun to me! OoO NOT FAIR!! I wanna go soo badly... TT-TT Sounds soo interesting... But how'll you sneak in? ^-^b Good luck!! Take pictures when you go! to hang out! I wounder what kind of obstacles they took. Also, about the picture of the grave yard it makes me think that the bodies are right there and they just covered it with dirt! IM: so that's where your mission was? i think that adds another place to the underground list if it counts for the dead!! maybey it is the same concept?? You're right! It DOES sound fun! and saukura: what sounds scary?
" Yucatan Penninsula where archaeologists have discovered a real-life portal to Xibalba, the mythical Mayan underworld. According to one archaeologist, ancient Mayan texts said the dead followed a dog along a path, "filled with obstacles, including rivers filled with scorpions, blood and pus and houses shrouded in darkness or swarming with shrieking bats." "